A much-loved, iconic marker in Melbourne, the Skipping Girl Vinegar neon sign has, over time, entered the psyche of the people, generating fond nostalgic memories when sighted. 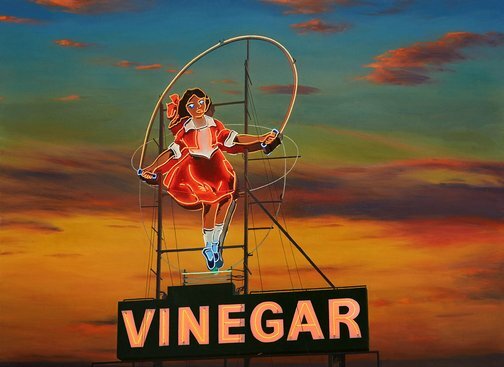 The ‘Skipping Girl’, also known as ‘little Audrey’, was the first animated neon sign in Australia, erected in 1936 at Victoria Street in Abbotsford as an advertisement for the now-defunct Skipping Girl brand of vinegar. The peculiar connection between vinegar and a skipping girl is due to a skipping rhyme, ‘salt, vinegar, mustard, pepper, if I dare, I can do better…’ to which the rope would be spun faster. Use the APositive app on your phone or tablet to unlock augmented reality content for this painting.